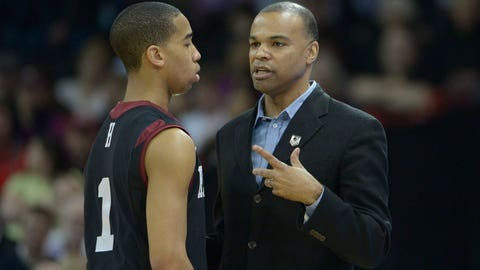 Harvard coach Tommy Amaker instructs guard Siyani Chambers during Thursday's victory over Cincinnati. SPOKANE, Wash. (AP) — It’s more than a figure of speech to say Harvard’s last trip to this stage of the NCAA tournament felt like an elbow to the face — especially if that face belongs to Siyani Chambers. Early in the second half against Arizona, the Harvard guard took a wicked elbow to the mouth from Kevin Parrom of the Wildcats. Part of Chambers’ front tooth chipped off, and one of his teammates fished the fragment off the floor and handed it to him. "The tooth hurt for a little bit," said Chambers, who went to the dentist shortly after to have the incisor repaired. "The loss to Arizona, it hurt a lot more and it hurt for a lot longer time." A year after taking a 23-point thumping at the hands of the Wildcats, the Crimson (27-4) are back in the third round. They bring with them all those warm-and-fuzzy Ivy League hopes and dreams, but this year, those are tempered by the fact that Harvard basketball is no longer such a novelty. Also, their opponent Saturday might be even better than last year’s. It’s Michigan State (27-8) — a No. 4 seed that’s been looking and acting much better than that since the calendar flipped to March. Coach Tom Izzo, who has been watching the Harvards and Mercers and Daytons and North Dakota States turn in a steady diet of wins for the double-digit seeds, is the last man to get excited about playing this 12 seed. "I was hoping for a forfeit, if I was to tell you the honest-to-God truth," he said. No such luck, though he’s got a pretty good group to take into this game. Adreian Payne is coming off a career 41-point day in a 93-78 win over Delaware. If he can’t repeat, Izzo’s got three other double-digit scorers, all of whom are back to full health at the same time for the first time all season. "Whether it’s us or anybody else, you just have to be better that day, and maybe a team doesn’t play as well as they’re capable of playing that day," Harvard coach Tommy Amaker said, when asked about the so-called upsets his team has pulled off in two straight tournaments. On Thursday, Harvard beat Cincinnati 61-57 in a result that surprised almost nobody. The players say the key to following this one up is turning the page more quickly than they did last year. They all came to Harvard because Amaker wooed them on the idea of making history. Two years ago, they got the Crimson to the NCAA tournament for the first time since 1946. Last year, they won their first tournament game in 102 years of basketball. This year, to take another step forward, they must overcome one of the best teams, and programs, in the country. "We’re getting better and better slowly, so obviously, the next step would be to win two games in the NCAA tournament," senior Brandyn Curry said. "That’s what we’re aiming to do. At least." OLD FRIENDS: Back in the 1990s, Izzo was an assistant at Michigan State and Amaker was an assistant at Duke. They got to know each other on the recruiting trail, where the prize catch was Chris Webber. Both came up empty, losing out to Steve Fisher, the then-Michigan coach who is also in Spokane this week coaching San Diego State in the West regional. REPEAT POSSIBLE: Asked if he needed to bring Payne back down to earth, Izzo said, "Hell no. I tell him to do it every day if he can." What the coach found reassuring about Payne’s effort is that very few of the shots were forced and the 6-foot-10 forward stayed true to the inside-outside game that has made him one of the best power forwards in the country. DOUBLE TROUBLE: Every Harvard starter averages in double figures. Laurent Rivard is the top 3-point threat. He’s made 78 this season. QUICK TURNAROUNDS: No teams know the back-to-back drill better than the ones in the Ivy League. They play their conference games on Friday and Saturday nights in order to avoid missed class time. Amaker’s teams are 23-5 the last four years on the second half of back to backs. Advantage Harvard? Not necessarily. Izzo has an 18-3 career record in the second game of an NCAA weekend. THIRD EYE BLIND: Curry was getting a lot of strange looks — he thinks — when he came off the court against Cincinnati holding his right eye even though there was blood running out from underneath his left one. Turns out, both were hurt. He got poked in the right eye, scratched below the left eye. He said both were fine Friday.